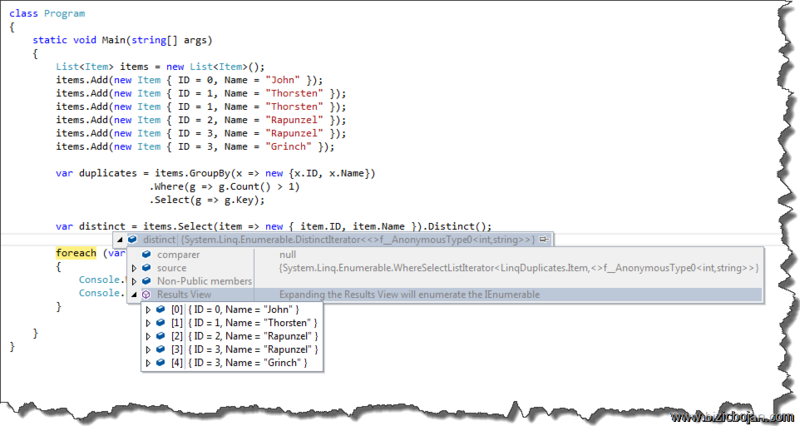 I needed very quick simple “one line” solution to filter out duplicates in my list. So I have a List<T> where T is complex object with multiple properties. I wanted to filter out non unique items based on two fields. In database analogy my list is table with two columns based composite primary key and I need to select non-distinct values. So this code will select just one duplicate I have in list and that is Item with ID=1 and Name=”Thorsten”. This results in list with all the distinct values based on two fields (composite key) criteria.